The Nordic countries Denmark, Sweden and Norway are ideal for city breaks and long weekends. All countries are easy to get to, thanks to the many European airlines and budget carriers that fly to Scandinavia daily. Norway’s capital Oslo has many excellent museums, great architecture, a busy culture and music scene, and a great nightlife. In the summer, visit the Oslofjord where you can take boat trips, go swimming or try island hopping. Like people in all Nordic countries, the residents in Oslo love their outdoor activities, and the Oslo Summer Park and the Oslo Winter Park have many opportunities for seasonal sports. There are flights to Oslo from all major European cities, and many low-cost airlines fly to Norway. Trains are popular for domestic travel, and there are several scenic railway journeys in the country. The Bergen Railway that starts from Oslo and travels to Bergen via the Hardangervidda mountain plateau is one of the most beautiful train journeys in Europe. Denmark is known for having some of the happiest residents in the world. There are flights to Copenhagen from most major European cities, and Copenhagen is the main hub for Scandinavian Airlines (SAS). There are daily flights to Copenhagen from London, and many budget airlines fly to Denmark too. Like other Nordic cities, Copenhagen is made for walking. It is easy to walk between the main tourist attractions, and for the attractions further away you can always rent a bicycle. Danes like to cycle, and if you enjoy active holidays, cycling is a great way to see the country. Bicycles can usually be transported on ferries and trains. The Little Mermaid statue is one of Copenhagen’s main tourist attractions, and many visitors stop by the Amalienborg Palace, the royal family’s residence. 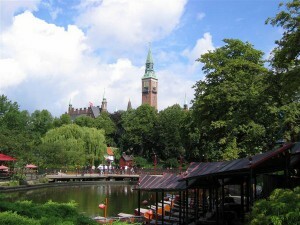 Tivoli Gardens is Copenhagen’s famous amusement park and perfect for both kids and adults. Strøget is the main shopping street in Copenhagen and a great place to spend a few hours. Stockholm is the main air travel hub in Sweden, and there are daily flights to Stockholm from several cities in Europe. There are also regular ferries between Stockholm and Helsinki (Finland). Travelling around Stockholm is easy, thanks to its modern and efficient public transport. Boats operate between Stockholm and the islands in the Stockholm archipelago. Stockholm is a beautiful summer city. It consists of 14 islands, and outside the city are the thousands of small islands and islets in the Stockholm archipelago. Stockholm’s Gamla Stan, the medieval old city, is a picturesque area with historic attractions, small shops and boutiques, cafés and markets. The Skansen open air museum is a good place for the whole family, and the Gröna Lund amusement park is one of the highlights of a family visit to Stockholm. Stockholm is also known for its trendy nightlife, its culture and its good shopping. Late June, July and August are the busiest holiday times in the Nordic countries. If you can travel outside the peak season, it is usually possible to find much better deals. Christmas is another peak travel time, but it is also a magical time to visit Scandinavia.